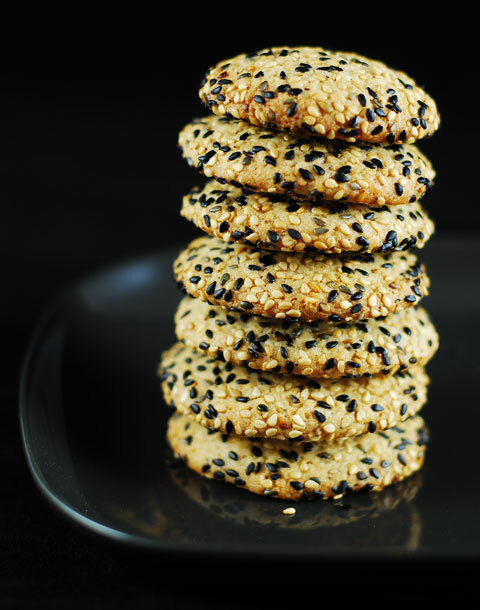 Native to Indonesia and tropical Africa sesame seeds are considered to be a symbol of luck and happiness.I can not say what is the intensity of this sensation but I can guarantee you at least the minimum time of happiness: the time you eat my sesame cookies. I must admit that these are probably the most popular cookies in our house. My husband is a real sesame cookies addict and he is crazy about them. 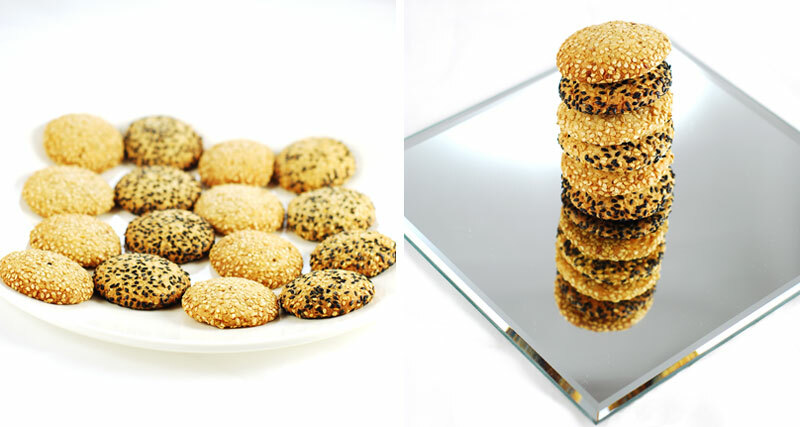 This is my classic sesame cookies recipe with slightly reduced amount of sugar and two types of sesame seeds. These cookies are really delicious, buttery inside and coated with a nice crunchy sesame shell. Enjoy my sesame cookies you cookie monsters! Roast sesame seeds in a dry frying pan (about 5 minutes on a low heat, until the sesame seeds begins to smell nicely). Mix butter with 2 types of sugar and vanilla sugar. Add egg. Sift flour with baking powder, cinnamon and salt and gradually add to the dough still mixing. At the end stir in half of the sesame seeds. Refrigerate the dough until firm (for at least 1 hour). Preheat the oven to 190ºC (375ºF). Remove the dough from the refrigerator and roll small balls about 3cm in diameter (you can form them with a spoon, but it is easier to use a small ice cream scooper and then roll the ball in your hands). Roll each ball in remaining sesame seeds. Place the cookies on the prepared baking sheet lined with baking paper, spacing the cookies a couple of inches apart (a maximum of 20 balls on a large oven baking tray). Flatten each cookie slightly with your palm. Bake for about 10-15 minutes, until golden (golden ! , not brown, be careful not to overbake, the longer the baking time the crunchier the cookies, I prefer them baked for 11-12 minutes, but it depends on the oven, of course. Remove from baking paper when cooled. What is your measurement for the vanilla sugar? This sounds amazing! I'd love to make them - how much vanilla sugar is in a package? Riley and Anna, I have just added metric and US measurements for vanilla sugar in the recipe. Sophia, you're right - there are few desserts with sesame seeds. 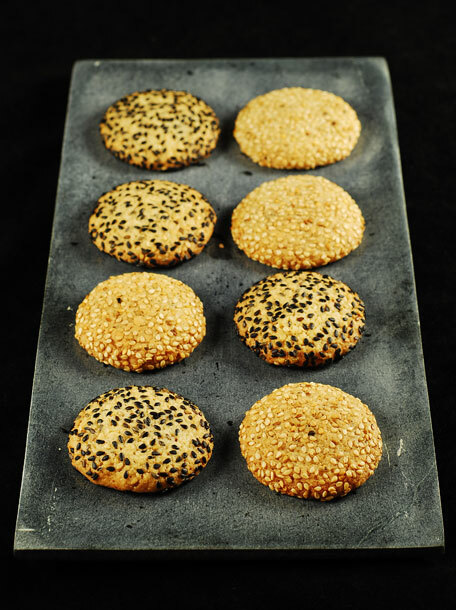 I have to try a middle eastern recipe with sesame and honey - sounds quite similar to sesame snaps. These Italian cookies from your link sound nice, too. I've been making these cookies again and again since discovering this recipe. It's a dessert that is not overly sweet and everyone loves them. Thanks for the recipe!